At the risk of losing credibility, I have to say that I was disappointed by Paul W.S. 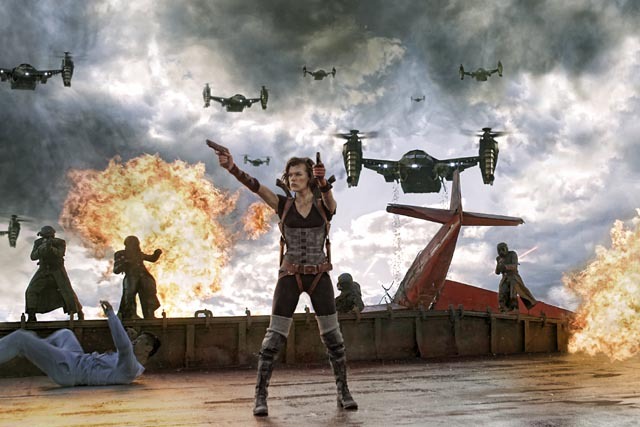 Anderson’s Resident Evil: Retribution, which opened theatrically today. Anderson is a frustrating figure because he’s capable of excellent genre filmmaking, but also regularly shackles himself to video-game-based projects. This began immediately after he left England in the mid-’90s following the hostile reception of his impressive debut feature, Shopping (1994). In the States, his first production was Mortal Combat (1995), a movie which barely makes an effort to concoct a plot or draw actual characters as the whole point is the non-stop fight scenes. This looked like a minor diversion when Anderson followed it up with Event Horizon (1997) and Soldier (1998), both under-rated sci-fi movies, the latter giving Kurt Russell one of his best roles. But then, in 2002, Anderson launched the Resident Evil franchise which has preoccupied him ever since as producer, writer and occasional director, interspersed with a handful of unrelated projects – Alien vs. Predator (2004), which is also structured like a video game; Death Race (2008), his masterpiece and one of the finest action films of the past decade; and his entertaining steam-punk version of The Three Musketeers (2011). It’s because of the two earlier SF films and these last two that his new Resident Evil effort is such a disappointment. I’m not a gamer myself, and I know that a lot of fans dislike these movies because they don’t “get” the game; I can only judge them as movies. 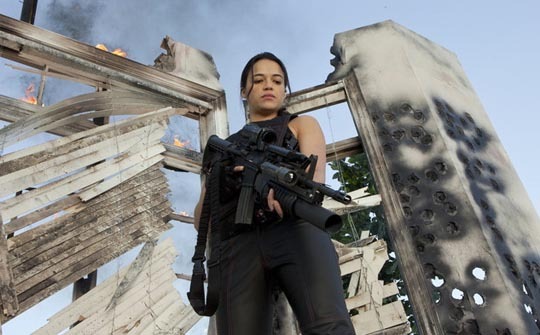 The first film followed the formula of characters working their way through confined spaces (an underground lab complex), endlessly shooting monsters (zombies and mutants created by the Umbrella Corporation’s bio-warfare experiments). The second film in the series, Resident Evil: Apocalypse (2004), was written and produced by Anderson, but directed by Alexander Witt. This opened up the story somewhat by widening the field of action to all of Raccoon City, beneath which the Umbrella lab is located, adding more characters to the combat, and beginning to develop the character of protagonist Alice (Milla Jovovich, for whom the series has become the defining centre of her career). Alice is also a product of biological experimentation, naturally immune to the virus which is devastating the population, but also developing phenomenal physical and psychic powers which make her a target of the evil controllers of Umbrella, who basically want to dissect her to see what makes her tick. This theme is further developed in the third (and best) feature of the series, Russell Mulcahy’s Resident Evil: Extinction (2007, again written and produced by Anderson), which goes global. On the run, Alice encounters a group of survivors in the desert and, somewhat like Mad Max, is reluctantly drawn in to helping them find a safe haven, which may exist somewhere in the far north. And like Max, she can’t go with them, taking on the mythical hero role, driven to uncover the truth about her own origins. After Death Race (inexplicably reviled by many critics and fans – Roger Ebert gave it a half-star total pan), Anderson took back directorial control of the Resident Evil series, pulling it back from the narrative expansion of the third film and resuming the more confined, video-game feel of the first film. Number four, Afterlife (2010), has Alice following the route of the survivors from Extinction only to discover that the safe haven was an Umbrella Corporation trick to lure the immune to a floating lab where they can be experimented on. With the unnecessary addition of 3D, Afterlife feels gimmicky (random new monsters are tossed in for set-piece fights) and the development of Alice as a character seems stalled. On top of which, the film ends in mid-action, blatantly preparing the way for the next sequel. Which brings us to Retribution. I managed to get into a press screening two weeks ago, so had the pleasure of watching it (again unnecessarily in 3D) in a theatre with only two other people in the audience – no annoying distractions. My expectations weren’t very high, but I must admit that the title sequence hooked me; following immediately from the last shot of the previous episode, this big action sequence plays out in strangely haunting reverse. There’s a rather beautiful dream-like quality to it … which is immediately dispelled after Anderson’s director credit, as the entire scene plays again in forward motion. The unavoidable sense of repetition doesn’t bode well for what follows. Why Anderson felt the need to drag the series back into this mode of tedious non-narrative is a mystery, particularly since on a technical level – design, photography, staging of the action – his work is highly polished, and in past films he has shown himself to be a more than competent storyteller. The inevitable promise of yet another sequel doesn’t bode well as the gradual expansion of the narrative over the first three films appears to have given way to mere repetition in the last two. Hopefully, before he gets around to doing another in the series, he’ll at least come up with something in the interim to match Death Race or The Three Musketeers. This entry was posted in Commentary, Review and tagged Directors, Horror, Review, Science Fiction. Bookmark the permalink. Movies can be many things and have many purposes, one of them being entertainment. This one didn’t do it for me. Just my opinion. But I do find it interesting that so many people who disagree with an opinion about a movie these days use the “it’s just entertainment” line rather than an actual argument to counter a criticism.